the overseas inquirer. For further information, contact the foreign firm originating the inquiry. ALFALFA PELLET OR ALFALFA MEAL, BONE MEAL, DRIED SK -i TAIWAN). Quantity: 20' or 40' container. Quality: For feeding. Packaging: Bulk. Bank Ref: The Chang HWA, Business Dept., Taichung Head Office, Taiwan. SHOULDERS). QUANTITY: TO BE DETERMINED. QUALITY: 1ST AND STANDARD. HEIFERS, 4-6 MONTHS PREGNANT AT TIME OF AGREEMENT, NOT LISTED IN HERDBOOK. Agricultural Service, USDA, Room 4645-S, Washington, D.C., telephone (202) 447-7103. 4,200; Quality: B) 30% and 40%. C) N.2 D) 44-48%. J) 20% K) 60%. Ravenna-Italy. CONTACT: Peter J. Caliandro, Giuntini & C. S.p.A., Via SS. SOEKARNO-HATTA AIRPORT. QUANTITY: 400 CARTONS OF SIZE A10 OR 5KG CANS. QUALITY: CANNED PEARS AND PEACHES SMALL AND FIRM. DELIVERY: MONTHLY. CHICKEN PARTS AND PRODUCTS, TURKEYS, DUCKS (UNITED ARAB EMIRATES). PREFERABLY IN ARABIC. SHELF LIFE, ONE YEAR. QUOTE: CIF, SHARJAH, U.A.E. CHICKPEAS, GREEN GARDEN PEAS, AND LENTILS (RED SPLIT) (PAKISTAN). FAZLI CLOTHING, N.P. 14/43, KUDAN STREET, JUNA MARKET, KARACHI-2 PAKISTAN. AND ADDRESS, INGREDIENTS, NET AND GROSS WEIGHT, PRODUCTION AND EXPIRY DATES. HUSSAIN, PROFESSIONAL TRADING SERVICES, P.O. BOX 5549, MANAMA, BAHRAIN. CORN, OATS, POPCORN (PAKISTAN). QUANTITY: 200 TO 500 MT PER MONTH. HAMILTON & CO LTD, 1 LEATHERMARKET,WESTON ST, LONDON, SEl, UNITED KINGDOM. MANDI, SHEIKHUPURA ROAD, GUJRANWALA. 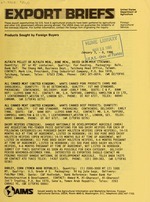 TELEX: 4577 PCOGR PK (ATTN: PASSEDD. TORTILLAS FROZEN, PEPPERS IN 4-5 LBS CANS. DELIVERY: EVERY SECOND MONTH. QUOTE: FOB. BANK REF: SE BANKEN. CONTACT: HANS TELLING, TACO BAR AB, P.O. QUANTITY: SOLE, SMOKED SALMON AND HALIBUT 150KG/MONTH; TROUT 100KG/MONTH. REQ: SGS REPORT; COUNTRY OF ORIGIN CERTIFICATE. QUOTE: C&F BY AIR OR SEA. TENDERLOIN, 2KG AND LARGER. CHOICE TOPSIDE, TRIMMED. DELIVERY: MONTHLY. PACKAGING: WRAPPED IN PLASTIC AND PACKED IN 28KG (APPROX.) CARDBOARD CARTONS. INT'L AIRPORT, P.O. BOX 3575, JAKARTA, INDONESIA. TELEX: 44016 ACS IA. MAWS THICK AND CLEAN, TAILS SHORT AND FAT. PACKAGING: 30 LBS/CARTON. TRADING CO, 8-1 JLN CHOWKIT KIRI, 50350 KUALA LUMPUR. TELEX: MA 30909. South Road, Taipei, Taiwan. Telex: 25902 DEJETEX. Phone: (02) 772-88106. LTD OAKLANDS HSE,OAKLANDS DR, SALE, MANCHESTER M33 INS. TELEX: 667740. PORT. BANK REF: MIDLAND BANK PLC GOLDEN SQUARE, PETWORTH SUSSEX GU28 OAR. LIVE BRONZE COLOR TURKEYS, OR TURKEYS W/COLORED FEATHERS (TAIWAN). COLE, R. SIMON & CO LTD, BROADWALL HOUSE, 21, BROADWALL, LONDON SE1 9PL. BY-PRODUCTS (PAKISTAN). QUANTITY: NOT SPECIFIED. QUALITY: NOT SPECIFIED. PACKAGING: RETAIL AS WELL AS BULK PACKAGING. DELIVERY: NOT SPECIFIED. QUOTE: FOB/C&F KARACHI. BANK REF: CHASE MANHATTAN BANK, N.A. KARACHI. A-GRADE. PACKAGING: PLASTIC OR GLASS BOTTLES. DELIVERY: NOT SPECIFIED. FOB/C&F KARACHI. BANK REF: HABIB BANK LTD, SMCH SOCIETY BRANCH, KARACHI. FOR SLAUGHTER TENDER NO 86/01, PLEASE CONTACT ATO TUNIS TELEX 14307 USATO. SHIPMENTS. QUALITY: FIRST QUALITY. PACKAGING: CARTONS (IN BULK). (LONDON) LTD, PRESCOT HOUSE, PRESCOT ST, LONDON, El 8BB, UNITED KINGDOM. STATES OF MIDDLE EAST. QUANTITY: ONE SHIPMENT OF 300,000 QUEENS. DELIVERY: BEFORE MAY 1, 1986. QUOTE: CIF BASRA. BA REF. : CA-VIENNA. SHIPMENTS. QUALITY: FIRST QUALITY. PACKING: CARTONS (IN BULK). FOB/C&F KARACHI. BANK REF: UNITED BANK LTD, PAPOSH MAGAR BRANCH KARACHI. Al-Gharassi Int'l Trading, P.O. Box 1270, Sana'a, Yemen Arab Republic. SUNFLOWER SEEDS (TAIWAN). Quantity & Delivery: To be negotiated. Quality: 22/64 round hole screen; North Dakota produced 1985 new crop. NECESSARY CERTIFICATES. QUOTE: CIF BANK REF: BANCO DEL EJERCITO 5A. U.S. BEEF (PHILIPPINES). QUANTITY: 10,000-20,000 KG. QUALITY: U.S.
LIVESTOCK FEED MANUFACTURERS IN INDONESIA. QUANTITY: 2,500 3,000 MT. 12 PERCENT MAX MOISTURE. DELIVERY: DECEMBER 85/JANUARY 86 SHIPMENT. TOP CHOICE. PACKAGING: 40-FOOT CONTAINER. TIME OF DELIVERY: 5-6 MONTHS. BE INFORMED). PACKAGING: TINS OR ALUMINIUM FOIL AND CARTON. QUOTE: C&F. dates. Stickers and overprints are prohibited. specifications. All food products are subjected to health inspection. already have an agent in Japan. Marketing briefs are periodically prepared by the Agricultural Trade Offices. FOREIGN AGRICULTURAL SERVICE, Room 4645-S.